Your flight begins at Redhill Aerodrome in Surrey. Once aboard one of our modern Helicopter Fleet your pilot will climb to a cruising altitude and pass overhead the beautiful Surrey countryside including villages such as Godstone, Oxted and Westerham. 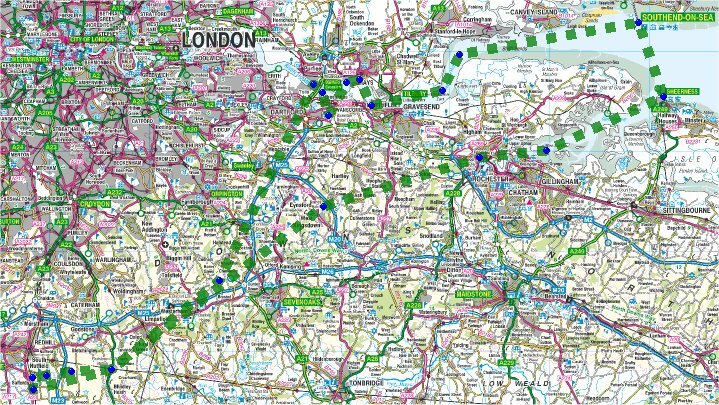 Your route will take you along the edge of the North Downes bordering South East London. Affording views of the London Skyline as you fly high above The M25 traffic past Sevenoaks. Turning North takes you past the Historic World War 2 airfield of Biggin Hill and on past Chelsfield and Orpington to join the River Thames at the impressive QE2 Bridge. Here you will be turning for The East Coast passing over the fascinating industrial landscapes of container ships, jetty’s and Factories that surround the Dartford crossing and the banks of the river up to City Airport and the Thames Barrier. Continuing east along the river you will fly overhead Tilbury Docks one of the major freight ports of the UK and on to Tilbury Fort (1680), one of the best examples of a Pentagon Fort in the country. 3 miles further on in the flight the route passes between the Coalhouse and Cliffe Forts (1860) facing each other across the river. The Ruins of Hadleigh Castle (1215) still stand on the Northern Bank of the River just past Canvey Island. Guarding against French invasion. Now an English Heritage site and former London Olympics 2012 site for the mountain bike event. Along the coast the flight passes along Southend Beach front and over Southend pier, the longest pleasure pier in the world at 1.34 miles. From Southend the tour crosses the river passing close to the wreck of the SS Montgomery a World War 2 ammunition ship sunk in the estuary with several thousand tons of explosives aboard, her masts still visible above the water. Crossing to the Kent side of the Thames takes you past Sheerness and up the Medway River towards the historic Royal Chatham Dockyard (1567), still home to numerous ex Royal Navy Warships and Submarines. Passing through the beautiful city of Rochester along the Medway river you will get an incredible view of both Rochester Castle and Rochester Cathedral. You will also spot the 2000 ton Russian Black Widow Submarine moored in the Medway near Strood. Leaving Rochester the flight will make it’s way back to Redhill Aerodrome taking in Knole House, one of the biggest Manor Houses in the UK with some 365 rooms and Brands Hatch race track a former Formula 1 track and currently used for touring cars and the Moto GP. After an hour in the air it’s now time to make an approach back into Redhill Aerodrome, perhaps make your way to one of the many great restaurants and pubs in the area to tell everyone all about the amazing flight you just had! Flight time: 60 minutes. 9 month voucher. Hire Whole Helicopter. £680 – up to 3 seats, £750 – up to 4 seats.